The New York Times - Is There Life After AOL? Is There Life After AOL? A n overprotective parent. Comfortable old shoes or pajamas. A bad marriage. People who subscribe to America Online, America's largest Internet service provider, use a variety of metaphors to describe their feelings about it. Like McDonald's, the fast food purveyor that people love to hate, AOL has many ambivalent customers. "What surprises me is that so many people use AOL but no one seems to like it," said Rose Miller, a potter in Sandia Park, N.M. "A lot of people complain about it." Ms. Miller counts herself among them. But even after being "driven crazy," as she described it, by the pop-up ads she sees on AOL 6.0, the latest version, she has stuck with AOL for three years because she and her friends have grown accustomed to using its Buddy List during their frequent instant- message exchanges. Now 16 years old, with more than 29 million subscribers, AOL is clearly still the behemoth among online service providers. It adds more than a million new subscribers every month or so, and its nearest competitors, the Microsoft Network, EarthLink and the prospective merger partners NetZero and Juno, have fewer than 20 million combined. Some customer turnover is normal in any business, and in the Internet service provider sector it generally ranges from 2 percent to 5 percent each month. GIVING UP - "I guess I fell into a rut," said Dusty Donaldson, a law firm employee in High Point, N.C., who plans to abandon America Online after seven years as a subscriber. But now more than ever, discontented AOL subscribers like Ms. Miller are being courted to switch. Led by Microsoft, whose tensions with AOL have recently risen in part because of Microsoft's efforts to include consumer features that rival AOL's in its new Windows XP operating system, competitors sense a few chinks in AOL's armor. The notion that AOL may be vulnerable is fostered partly by its recent price increase, the first since 1998, from $21.95 a month for unlimited access to $23.90 a month. There are other factors, too, including problems that have dogged AOL for years, like spotty access and the pop-up advertising and junk e-mail that so many customers find annoying. And some providers are promoting their broadband capabilities as an alternative to AOL, which is several years away from offering widespread access through anything other than dial-up modems. Last month, shortly after AOL said it was increasing its unlimited-access price, Microsoft announced a $50 million campaign to attract AOL customers, offering people who signed up with MSN three free months of Internet access and a monthly rate of $21.95 until 2003. EarthLink has been running print and television advertisements inviting Internet users to surf the Web freely and at their own discretion, an apparent jab at AOL's self- contained, protective environment. And NetZero and Juno continue to offer free or low-cost access to lure bargain hunters. "Right after the increase, the calls to our call center went up 50 percent," said Yusuf Mehdi, Microsoft's vice president for MSN and personal business services. "Up until recently, no one thought there was an alternative to AOL, and the last time they raised their price, it didn't impact the business at all. This time, there is a big change in terms of what's going on with consumers." Mr. Mehdi would not comment on the number of new subscribers MSN had gained since its offer last month. Jonathan Sacks, president of AOL, said the company was not concerned by its competitors' moves. "We've managed to aggregate the largest online audience in the world by paying attention to our customers," Mr. Sacks said. "Our interest is not what our competitors say about us or even what they're doing." While AOL's price increase has caused some defections, analysts say the number of users who switch solely because of cost probably won't be significant. In fact, AOL has more than doubled its subscriber base since the 1998 increase, when the monthly fee went from $19.95 to $21.95. "The $2 difference is not enough to make the dedicated customer change," said Gary Arlen, president of Arlen Communications, an Internet consulting firm in Bethesda, Md. "There's enough there to make it worth the $24 to stay with it." For that price, AOL gives subscribers e- mail, Microsoft's Internet Explorer browser, Instant Messenger, original content from AOL partners, and special-interest chat rooms. Nonetheless, some analysts believe that AOL's price increase is an opportunity, if a challenging one, for competing Internet providers to differentiate themselves as AOL customers consider their options. "The large I.S.P. 's like MSN can afford to develop content and applications, where the smaller ones are having to focus on the quality of access and customer service," said Rob Lancaster, an analyst at the Yankee Group in Boston. NetZero, for example, continues to offer both free and bargain-basement services. "People who open their eyes are coming to the realization that they can save a lot of money if they do a little shopping for an I.S.P.," said Mark R. Goldston, chairman of NetZero. EarthLink and AT&T WorldNet are promoting their claims to outstanding customer service and trouble-free access with their dial-up and broadband services. "AOL believes that their access fees give them an open license to collect extra revenue from their subscribers," said Garry Betty, chief executive of EarthLink. "We're going to compete with AOL much as we have in the past, by providing a better access experience to our user base. Simple things, like making sure you don't get busies at peak and that your e-mail doesn't go down." An online study of 646 former AOL users last December by Jupiter Media Metrix, an Internet research firm in New York, found that 46 percent cited trouble dialing into AOL among their reasons for switching, while 45 percent cited lower prices offered by AOL's competitors. But for some AOL subscribers, the price increase alone is enough. Dusty Donaldson, who works for a law firm in High Point, N.C., had subscribed for seven years and put up with things like a bombardment of ads with what she called big "Tell Me More" buttons and tiny "No Thanks" buttons. "As soon as I found out about the price increase this time around, I made up my mind," Ms. Donaldson said. "I will be leaving. I'd been considering other options for some time now, but this was just enough to make me take action." 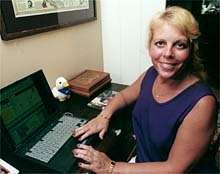 Why did Ms. Donaldson stay with AOL for seven years? "I guess I fell into a rut," she said. "I was reluctant to get out of it because people know my e-mail address, but it's like a bad marriage, and after a while you just finally say, I'm going to get out." The amount of advertising, which 25 percent of those surveyed by Jupiter Media Metrix cited as a reason for switching, is another common complaint among AOL subscribers, even among those who stay with the service. "They could probably free some of it up," said Jeff Disaris, a graphic designer in Palmdale, Calif. "I don't think Time Warner is starving." Nicholas Graham, a spokesman for AOL Time Warner, said that customers had an option to turn off pop-up ads but that some may not want to do so because many of the ads represent good offers. Analysts point to a different area that may have cost AOL some customers over the last year: the competition to provide high-speed Internet access, particularly digital subscriber line (D.S.L.) service. Some analysts say AOL has not marketed such services as aggressively as its competitors have, although its merger with Time Warner is ultimately likely to change that. "AOL hasn't gone out with D.S.L. the way they will be when the Time Warner cable infrastructure is in place, while EarthLink has been very aggressive in their broadband rollouts," said Zia Daniell Wigder, senior analyst at Jupiter Media Metrix. "AOL is going to have to play catch up with some of the existing broadband I.S.P. 's as well as some of the traditional I.S.P. 's that have gone after the broadband market." Peter Gorman, a photographer in New York, used AOL for several years before switching to Verizon's D.S.L. service last fall. He had been unaware that AOL offered D.S.L. service but said he would have made the change even if he had known. Mr. Gorman had stayed with AOL because his friends were subscribers and he liked the feeling of "going to a tiny room" during a time when the Internet was growing so rapidly. "But it became this huge, messy room that you'd have to plow through before you could find your way out to the Web," he said. "It was like your parents have pampered you for so long that you're afraid to go out into the real world, but then you realize that the real world is much more exciting." That some users were Internet novices when they started with AOL but have since outgrown some of the service's beginner- oriented features is not lost on competing providers like AT&T WorldNet. "My sense," said Kevin Crull, senior vice president in the consumer division of AT&T, "is that once AOL users come to know and realize that the same content is very conveniently available to them in other ways, I think they are much more comfortable with switching." Meanwhile, AOL subscribers who have stayed put are already reaping the benefits of its Time Warner partnership, said Mr. Sacks, AOL's president, citing discounted subscription offers to Time Warner magazines and special access to tickets to see Madonna (a Warner Music Group artist). Mr. Sacks said he paid little attention to the notion that AOL is for beginners and that users move on once they find their way around the Internet. "Just because you've been doing something a long time doesn't mean you'll suddenly have a desire to do it the hard way," he said. Once it rolls out its broadband service in the next two years, he predicted, AOL will evolve substantially. Until broadband AOL access arrives in full force, however, some subscribers, like Mary Alice Quimby, are switching to less expensive price plans offered by AOL as they try out local broadband services. Ms. Quimby, a dog breeder in Vista, Calif., recently signed up with her local cable outfit as an Internet service provider while maintaining her AOL account for $9.95 through the company's bring-your-own-access plan. "As much as I complain about AOL, it was kind of painful to totally dump it," she said. "It's the comfy shoes that aren't stylish. I've struggled with it since the beginning, and I know how to manipulate around it, and what to expect in the way of negatives."